I don't know when I will find time to get all the 12 tags of Christmas done - this is Day 5, but I have missed days 1 and 2 and now have days 6 and 7 to catch up on as well. I stayed up till the early hours of this morning catching up with bits and pieces and couldn't finish this one till the post arrived this morning as I didn't have the metal flower and foliage. As it is I've used different stamps and numbers - but hey ho as I said yesterday that's some of the fun of doing these tags. If you haven't been over to Tim's blog to see his inspiration then pop over now to have a look. Each day is so different but everyone just stunning. Hope your week is going well, I am slowly getting the decs up, and love it when it is all done. At least Ken got the outside lights up and working at the weekend. Of course we are the first house in the close to do so. 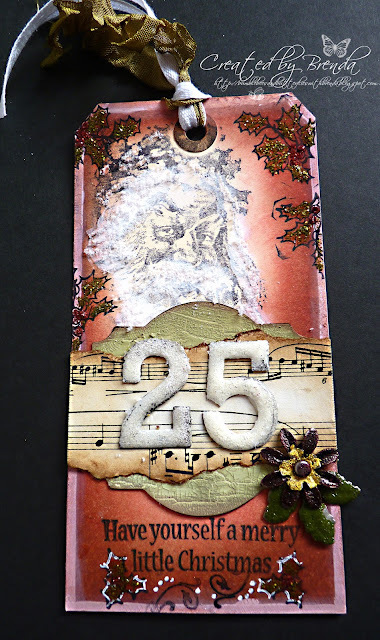 Lovely Christmas tag, Brenda ....and it looks like these are alot of fun to make!! Gorgeous tag, Brenda! The colours are stunning and lots of detail. Have a great day! This one's really splendid - if they're getting better day by day then I can hardly wait for day 12! another beautiful Santa Brenda - love the holly.. and the manuscript. what a gorgeous tag Brenda...I have never made one because I just don't really know what to do with a finished one.......thanks for your kind words and I keep following you! Another fab tag Brenda, a lovely take on it, I put my tree up today but didn't get any other decorations done. Wow Brenda, this is just beautiful! Brilliant tag Brenda, love seeing different elements then what Tim used makes it more original.